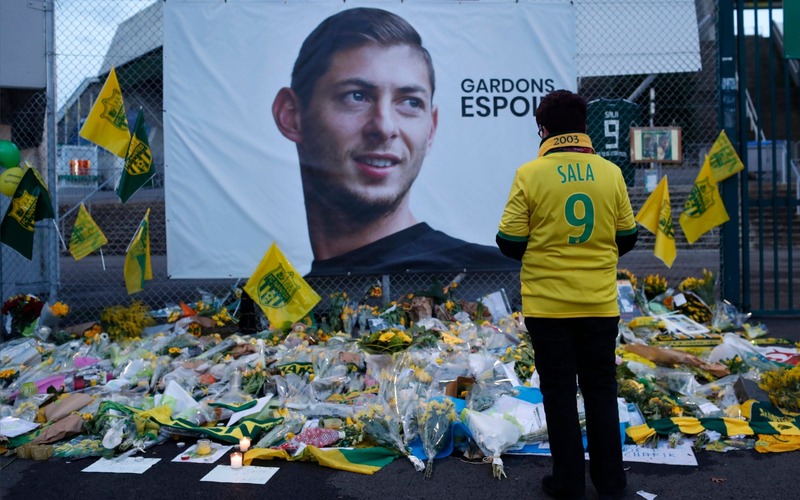 Tributes from the football world poured in after the body retrieved from the wreckage of a crashed plane in the English Channel was formally identified as Cardiff City's Argentina-born football player Emiliano Sala, British police said in a statement on Thursday. Dorset Police said the families of Sala and the pilot David Ibbotson had been informed. "Our thoughts remain with them all", police said. The news, confirmed by Dorset county police, brings to an end a dispiriting two and a half weeks since the plane carrying Sala and pilot David Ibbotson disappeared on January 21 while traveling from Nantes, France, to Cardiff City, Wales, where the Argentine was set to debut as Cardiff's record signing at almost $20 million. On Saturday at Cardiff's home Premier League match against Bournemouth, the Cardiff players held up a T-shirt bearing the image of Sala, who never played a game for the club, after the team scored in the fifth minute. Dorset Police identified the body Thursday night. There is still no word on Ibbotson, with fans praying the Lincolnshire pilot's family would soon get closure too. After the confirmation of Sala's death, Cardiff issued a statement saying "he and David will forever remain in our thoughts". Subsequently AAIB and privately funded search teams were deployed to the relevant area.